The rocket launched from Wallops Flight Facility on Virginia’s eastern shore at 4:25 a.m. and reached an altitude of 118 miles. The flight lasted eight minutes. Four to five minutes in, it deployed 10 canisters about the size of soft drink cans, each containing a colored vapor that forms artificial, luminescent clouds. The launch of the sounding rocket. They were released 100 miles above the ground, posing no risk to observers. The payload landed in the Atlantic Ocean, about 90 miles (145 kilometers) out to sea from its launch point in Virginia. 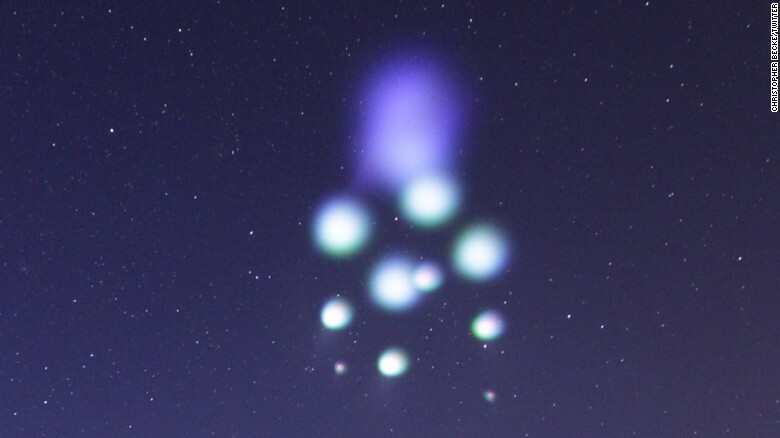 The Wallops facility received 2,000 reports and photos captured by onlookers of the colorful clouds up and down the Mid-Atlantic coast, including Virginia, Maryland and Pennsylvania. Christopher Becke, a high school physics teacher in Williamsburg, Virginia, captured images and a timelapse of the clouds. The rocket’s launch has been delayed several times since its originally scheduled launch on May 31. The most recent attempt, on June 24, was foiled by extensive cloud cover. Previous attempts were scrubbed for various reasons, from strong winds and clouds to boats in the potential payload landing area. Sounding rockets have been used for more than 40 years to carry science payloads on missions that last five to 20 minutes. The vapor tracers will allow scientists on the ground to view the movement of the particles in the ionosphere, a part of Earth’s atmosphere that stretches to the edge of space, to learn more about the movement of the air currents at that altitude. Watch Professor Brian Cox explain how he believes time travel is possible!